Canada: When Is An Environmental Contamination Claim Too Old To Extend The Limitation Period? 40 to 60 years may be too old when determining whether to extend a limitation period for a negligence-based environmental contamination claim, the court recently ruled in Brookfield Residential (Alberta) LP (Carma Developers LP) v Imperial Oil Limited, 2017 ABQB 218 [Brookfield]. In Brookfield, the likelihood of prejudice to the defendant in granting an extension was significant since the alleged cause of the environmental damage occurred over 60 years ago, witnesses and documents were no longer available, and expert evidence on the standard of care at the time would be impossible to obtain. 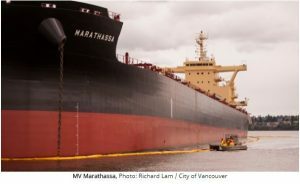 The facts of Brookfield involved a claim brought in negligence against Imperial Oil Ltd. (Imperial) by Brookfield Residential (Alberta) LP (Brookfield) based on environmental contamination from an oil well. Imperial drilled and operated the well between 1949 and 1950, and disposed of it in either 1950 or 1954. A different owner operated the well between 1950 and 1957 and then used it for salt water disposal between 1958 and 1961, at which point the well was decommissioned and abandoned. 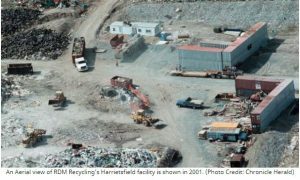 Contamination requiring remediation was not discovered until 2010 when Brookfield was preparing the site for residential development. 218(1) A judge of the Court of Queen’s Bench may, on application, extend a limitation period provided by a law in force in Alberta for the commencement of a civil proceeding where the basis for the proceeding is an alleged adverse effect resulting from the alleged release of a substance into the environment. (d) any other criteria the court considers to be relevant. With respect to the first factor (218(3)(a)), the court decided that it did not have enough evidence to determine when the environmental damage occurred. On the second factor (218(3)(b)), the court found that there was evidence that Brookfield exercised the necessary due diligence. The court further determined under 218(3)(d) that no additional relevant factors were present. The extension of the limitation period, therefore, turned on the possibility of prejudice to Imperial. The court held that extending the limitation period would cause prejudice to Imperial, and that such prejudice outweighed the other factors under section 218(3). Imperial says it cannot even point to specific missing witnesses or missing documents, and this goes to the heart of the prejudice that it will suffer if this matter proceeds. More than 60 years later, Imperial does not know who could have once spoken to these events or who could have identified the specific relevant records. Undoubtedly, close analysis might indicate that the prevailing practices were negligent, but that would appear to be the result of hindsight and a fundamentally different approach to environmental protection. … It would, in my view, be unfair to consider the appropriateness of 67-year-old practices without reliable evidence of what the practices were then. The court held that “calling the expert evidence required to establish the standard of care 60 years later would be, in the words of our Court of Appeal, ‘impossible’”, applying authority that would indicate that 40 years may be too old as well. In light of the passage of time, the loss of witnesses and documents, the difference in the standard of care, and the impossibility of finding experts to establish the standard of care, the court ruled that Imperial would suffer significant prejudice if the limitation period was extended. Upon balancing this prejudice with the first two factors in section 218(3), the court held that the limitation period should not be extended and granted summary judgment to Imperial. Brookfield represents the first case concerning section 218 of the EPEA in which the court found that the claim would cause significant prejudice to the defendant. In effect, it judicially creates an ultimate limitation period for negligence-based environmental contamination claims of 40 to 60 years. Whether the same result would follow for a contamination claim not based on negligence remains to be considered–while some of the factors the court points to (loss of witnesses and documents) will be similar in such cases, the applicable standard of care and expert evidence concerning the standard of care will not be. In light of Brookfield, potential claimants should carefully assess whether a claim that arose decades ago is likely to give rise to a presumption of prejudice before advancing an application to extend the limitation period. Scott H.D. Bowers is a Corporate, Commercial, Securities and Energy Lawyer at Bennett Jones in Calgary, Alberta. Head of Legal Research for the firm in Alberta, Scott Bower represents clients in corporate, commercial, securities and energy litigation matters. He appears before all levels of court in Canada and before disciplinary bodies and provincial securities commissions, representing corporations, governmental agencies, banks and individuals. Russell J. Kruger is a Research Lawyer at Bennett Jones Calgary, Alberta. Russell has a research-oriented practice spanning a variety of areas, including energy, construction, franchise, arbitration and other corporate and commercial matters. Russell engages in review of technical and complex questions of law, and assists with preparation of written legal argument. Russell’s research-focused practice is informed by his previous courtroom experience as a litigation associate. Russell is also an Associate American Bar Association member. Stephanie Clark is a articling stud ent at Bennet Jones. She is a graduate of McGill law school and also has a B.A. from the University of Calgary. This article was first published on the Bennett Jones website. http://hazmatmag.com/wp-content/uploads/2017/01/hazmat-logo.jpg 0 0 John Nicholson http://hazmatmag.com/wp-content/uploads/2017/01/hazmat-logo.jpg John Nicholson2017-03-31 03:00:172017-07-21 07:30:10Canada: When Is An Environmental Contamination Claim Too Old To Extend The Limitation Period? The U.S. EPA, Office of Acquisition Management, RTP Procurement Operations Division will be hosting Marketplace 2017 in Durham, North Caroline on May 31st, 2017. The venue for the event is the Sheraton Imperial Hotel and Convention Center. The Marketplace event is a bi-annual regional “reverse” trade show that provides small business owners a broad-based business opportunity to meet contracting officers from over 50 large prime contractors and federal, state, and local government agencies. Contracting officers and representatives from industry will present training sessions and answer questions on a variety of contracting topics. The Marketplace 2017 website hosts the complete event agenda and electronic registration at http://www.sbtdc.org/events/marketplace/. 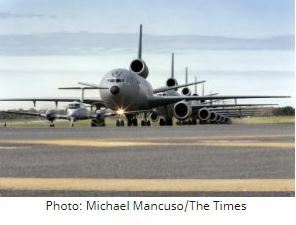 U.S. Department of Defence officials at the Joint Base McGuire-Dix-Lakehurst have confirmed that chemicals used in firefighting foam has been found in several groundwater sources on and off the base. The chemicals in question are perfluorooctane sulfonate (PFOS) and perfluorooctanoic acid (PFOA). 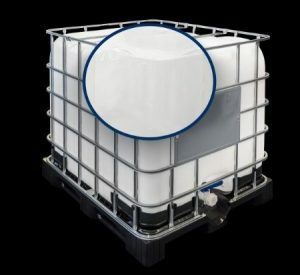 They are synthetic compounds classified that are components of Aqueous Film Forming Foam (AFFF), a type of fire-fighting foam. AFFF is the most efficient extinguishing method for petroleum-based fires and is widely used across the firefighting industry, to include all commercial airports, to protect people and property. On the base, the groundwater monitoring program consisted of testing approximately 165 groundwater monitoring wells and 28 drinking water sources. Results of analysis from groundwater samples show that 124 wells and two drinking water sources had contamination levels of PFOS and PFOA far in excess of the U.S. EPA health advisory for the compounds. In some samples, the PFOS/PFOA concentrations were thousands of time higher than the standard. The highest concentration of PFOS/PFOA was 264,300 parts per trillion. To provide Americans, including the most sensitive populations, with a margin of protection from a lifetime of exposure to PFOA and PFOS from drinking water, the U.S. EPA established the health advisory levels at 70 parts per trillion. When both PFOA and PFOS are found in drinking water, the combined concentrations of PFOA and PFOS should be compared with the 70 parts per trillion health advisory level. Results of analysis from groundwater samples taken from private wells off the base also showed high PFOS and PFOA concentrations. Of 131 off-base private drinking water wells tested, three were contaminated, and one had combined PFOS/PFOA levels of 1,392 parts per trillion. 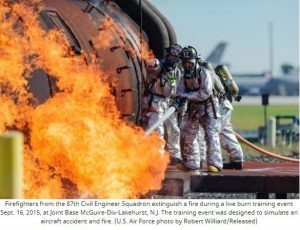 Since the 1970s, the Air Force used this foam at crash sites, in fire training areas and some maintenance hangers at active, Reserve, Air National Guard and former installations. The Air Force is systematically testing for potential PFOS/PFOA releases in soil, surface water and groundwater U.S. Air Force-wide where AFFF may have been used. inate to migrate off base. Currently, the U.S. Air Force is focused identify bases where there is PFOS/PFOA contaminated drinking water. If contamination is found in the drinking water supply, immediate action will be taken to provide an alternative drinking water source. Furthermore, the U.S. Air Force will initiate a long-term solution for safe drinking water which may include carbon filtration systems, plume-migration control, land use control, or other measures. Finally, the U.S. Air Force is taking measures to prevent further groundwater contamination by replacing PFOS/PFOA-containing AFFF with more environmentally responsible AFFF. Collaborators from Exxon Mobil Corporation and Oil Spill Response Ltd. recently presented a conference paper at the SPE Health, Safety, Security, Environment, & Social Responsibility Conference on technology advances for effective oil spill response. In their conference paper, they claim that there is a public perception that little has changed with respect to the tools used to clean up an oil spill. Additionally, the media have suggested that there is a lack of research effort to improve upon techniques that are generalized as static and archaic and the question has been raised wondering why industry does not invest in new and better approaches to removing oil from the environment following a spill. In reality, the presentation states that there have been a number of advances in all of the oil spill response tools and the and paper examines several of the demonstrated approaches as well as describes more developmental techniques that could significantly improve the ability to find and treat the thickest part of an oil slick. 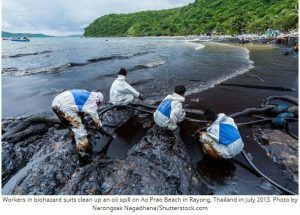 Aside from not having a spill in the first place, the next most favorable outcome would be to physically collect and remove spilled oil from the environment. While most spills occur as a single release and are usually relatively small, there are challenges associated with this, especially in the case of larger releases far from shore and during inclement weather. With this in mind, it is important to consider all response tools that may be brought to bear in the case of a spill. Enhancements have been implemented recently, e.g., higher efficiency skimmers, booms that function in faster currents, systems that allow for more efficient boom deployment in open water and in rivers, and temporary portable underflow dams for inland responses. New containment systems have been developed and the effective operational use of ISB has been demonstrated. The ability to use dispersants at depth provides an opportunity to respond to a spill as close to the source as possible, allowing for the use of less product than might be needed for a surface slick. A key aspect an effective response is the ability to identify the location of the thickest part of a slick, since it is often the case that the majority of the slick volume resides in a relatively small part of the area. By identifying the areas of thicker oil, it is possible to deploy response tools to those areas specifically in order to significantly increase their encounter rate. Each of the items within the oil spill response tool box will be discussed with the goal of improving awareness of the efforts of the oil spill response community to continuously improve response capabilities.